As with fellow Western actor Gary Cooper; Randolph Scott never tried to hide his age - and was always content to play the more middle-aged hero, rather than a younger romantic lead. Also as with Cooper; Scott's pictures tended towards slightly more adult themes. While not quite of the calibre of today's Clint Eastwood offerings, they were all several notches higher than the more traditional Saturday matnee fare of Roy Rogers, Hopalong Cassidy and Johnny Mack Brown. 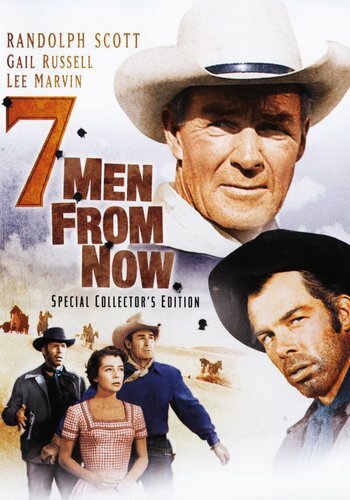 Seven Men from Now is today an almost-forgotten gem of the Western genre of half-a-century ago. Produced by John Wayne's Batjack company, it was directed by Budd Boeticher - with whom Scott worked on numerous horse operas. He co-stars here with Gail Russell; an up-and-coming Lee Marvin, and Walter Reed, while a young Stuart Whitman makes a brief appearance as a US cavalry officer. There's nothing new about the story. Former sherriff Ben Stride (Randolph Scott) is a loner, and on the trail of the seven criminals responsible for killing his wife during the course of a bank robbery. Surprisingly enough, Bill Masters (played by Lee Marvin) is not one of them - but Marvin steals each and every scene he appears in! Along the way, Stride encounters a young couple from the east: John Greer (Walter Reed) and his pretty wife Annie (Gail Russell). But is tenderfoot Mr Greer quite the man he appears to be...? Photographed in WarnerColor (that could certainly do with some computerised restoration! ), the editing is, at times, a bit jerky. But its a picture worth seeing - even if only to sigh at, while whistfully remarking that they don't make 'em like that anymore! The hunt is on for seven men. Seven murderous rogues who robbed a Wells Fargo freight station of $ 20,000, killing a clerk in the process. Ex-lawman Ben Stride is the man determined to track down those seven men, for it was his beloved wife who was murdered during the heist. During his quest, Stride encounters a struggling California-bound pioneering couple as well as an old nemesis, Masters, with whom Stride shares an uneasy alliance. All will find themselves swept into the drama of Stride's search for frontier justice. 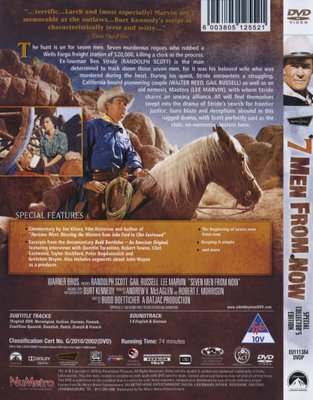 Audio commentary by Jim Kitses, film historian and author of "Horizons West: Directing the Western from John Ford to Clint Eastwood"